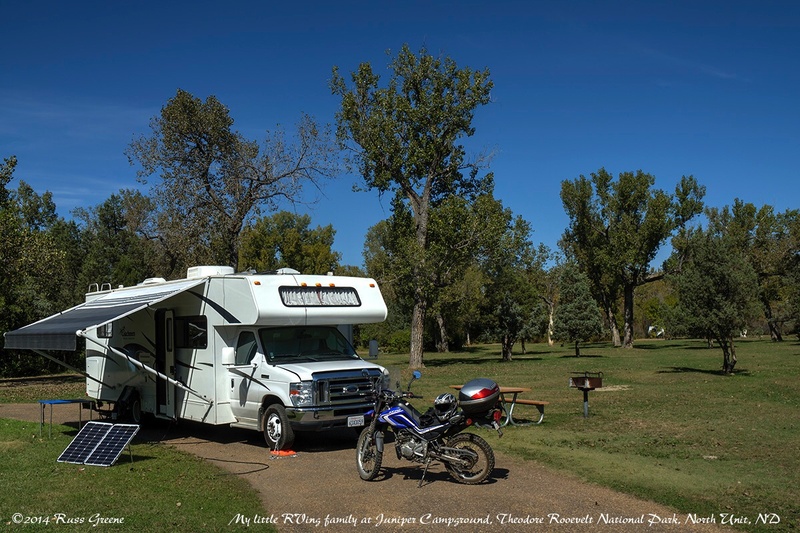 My little RVing family-Charlene, my RV, PeeWee my motorcycle, and Sunny my solar panel–in space 43 of Juniper campground, North Unit of Theodore Roosevelt National Park. GPS: N 47.59972, W 103.25533 These coordinates are to the turnoff from route 85 onto the main park road, not the campground itself which is about 5 miles up the park road. CELLULAR: None on my AT&T iPhone 5s; one bar, 1x sometimes 3G on my iPad Air although it wasn’t useful for data even with my Wilson Mobile4G cell booster. Traveling deeper into the park along the 14 mile park road I was able to pick up AT&T 4G signal and send and receive email as well as photos and videos. Verizon may have been accessible too but I didn’t carry my iPad with me to check. RECYCLING: Yes. Cans only at the campground but if I’m not mistaken more materials are accepted at the Ranger Station at the campground entry. BUGS: When I was there in mid September there were some bees, yellow jackets and wasps, and a few mosquitos, none in great quantities. Crickets and grasshoppers were abundant. 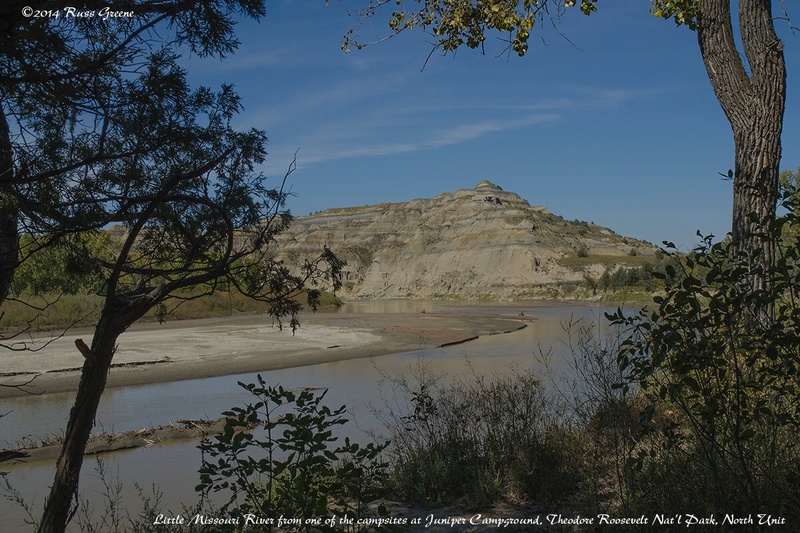 Surrounded by the magic that is Theodore Roosevelt national Park, I stayed 2 nights at the Juniper campground in the North Unit of park after having stayed a few nights at the Cottonwood campground in the South Unit . I’ve also a written a Travel Report about the park. Juniper campground is 5 miles up the 14 mile park road, which, if I’m not mistaken is the only paved road in the park. The campground road forms a lopsided figure 8 (see map below) with two loops around a central field with campsites being turnouts, pull-throughs or back-ins. The north loop is comprised mostly of walk-in and back-in sites whereas in the south loop sites are are pull-throughs and turnouts. The whole campground area seemed pretty level and I think getting level should be easy in most if not all sites. Some of the sites should be able to easily accommodate the largest Class A rig with towed vehicle. Some of the sites are well shaded, some are more open. I chose site 43 without much shade because I wanted sun for Sunny, my GoPower solar panel. I could have fit more than one more RV the size of mine, 33′, in the site. 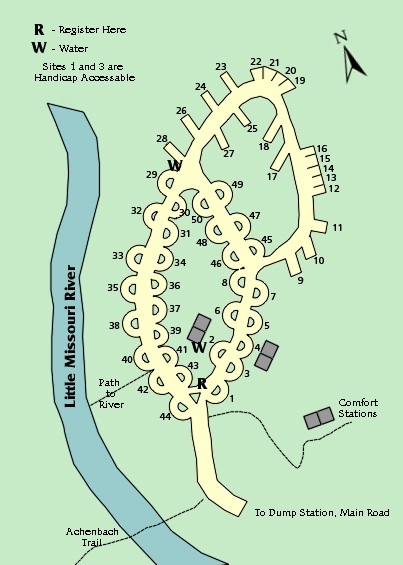 Some of the sites overlook the muddy Little Missouri River but you may not see it from the campground road due to tree cover. I don’t think the campground map is accurate as to scale and distance to the river. If you want a river view check sites 33, 35 and 38 first. The campground was very quiet when I was there. It was largely empty. There were times when the only audible sounds consisted of crickets, the rustling of the cottonwood leaves and the clump-clomp of my footsteps as I walked. One night and the following morning I heard a pack of coyotes howling and yipping wildly nearby. Today the grounds crew is here, one with a lawnmower, another with a weed-whacker. The campground is sometimes visited by bison. I didn’t see any in the campground as I did when in the Bridge Bay campground at Yellowstone, but there was clear “evidence” of their previous visits. On my drive of the park road from the campground to Oxbow Overlook at its western terminus, a drive that I made twice, I encountered bison in one area each time I passed and had to carefully navigate through the herd which straddled the road. There was “evidence” of bison in the campground but in the two days I was there I didn’t seen any in the campground. 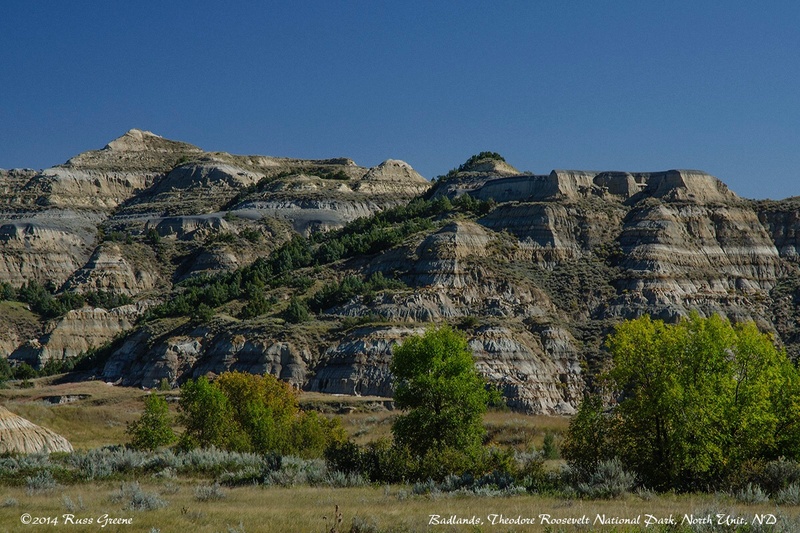 This campground is in the North Unit of Theodore Roosevelt National Park in North Dakota. I’d always imagined North Dakota as a frigid and barren landscape but as I write this report on September 16 I sat in the shade of my RV’s awning on a day where the temperature was about 75º, the forecast calling for warmer temps coming. That said, the mercury dropped below freezing the previous night. Imagine being a pioneer traveling by horseback or covered wagon in the valley below and trying to figure out how to navigate this place… That’s one reason they call it badlands. 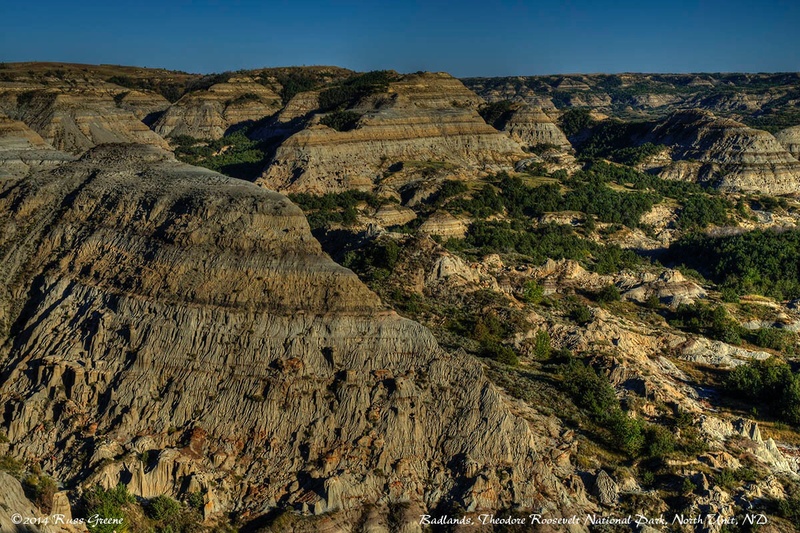 Much of the surrounding landscape of the park is known as badlands–land that is difficult to navigate because it’s a maze of hills and where it isn’t hilly the footing can be rough and unsure; lacking abundant water and which can be very hot–all around inhospitable. As contemporary travelers we needn’t concern ourselves with these things because we have paved roads and established hiking trails, but when you stand at one of the park’s overlooks with an expanse of badlands before you and try to imagine what it would have been like for pioneers and explorers who were navigating the country for the first time it’s not difficult to imagine why country like this is call the badlands. 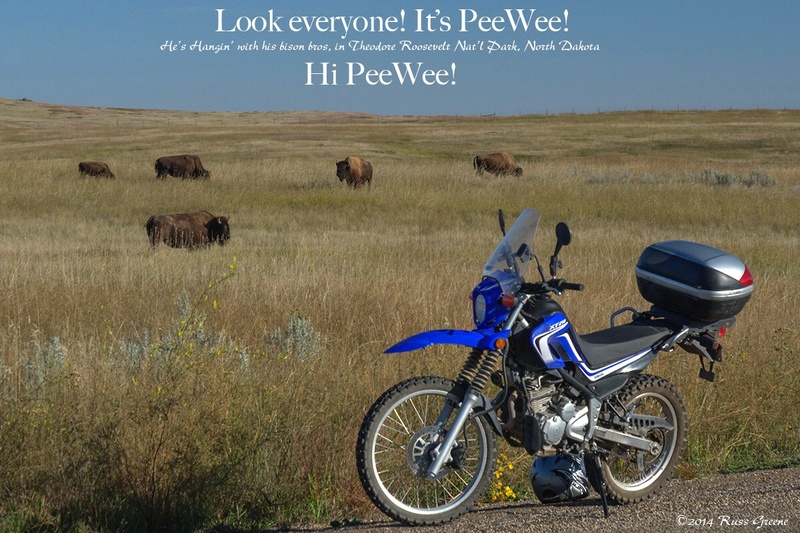 Some of the surrounding countryside is open, rolling plains and this is where you’ll most likely encounter bison. The park is a mix of plains and badlands. I have found abundant beauty here with subtle variations in color. Perhaps it has something to do with the season–some of the leaves that were green starting to turn yellow or orange, grasses that were greener becoming reddish brown. The land is also steeped in history as its namesake, Theodore Roosevelt, lived and worked within what is today’s park borders. He was, I have come to conclude, a remarkable man and I have adopted part of a quote attributed to him as the signature file for my email: “The welfare of each of us is dependent fundamentally on the welfare of all of us…” Should you visit the South Unit of the park I recommend and encourage a visit to the little museum within the visitors center. You have covered quite a few miles since Colorado! You’re close to Canada, perhaps you can visit a few parks there too-Banff is supposed to be very beautiful also. Did you bring your passport? Anyway hope that the Fall and Winter season will be warm and toasty in your RV where ever you are going! Enjoy-enjoy-enjoy!!! I do think I’ll be going to Canada this fall. Minnesota is my next stop. I don’t think you need a passport for Canada, do you? I’ve backpacked in Banff and been thru Jasper, Yoho and Kootenay. I’m just sitting down to write a report on Abraham Lincoln State Park in ND.